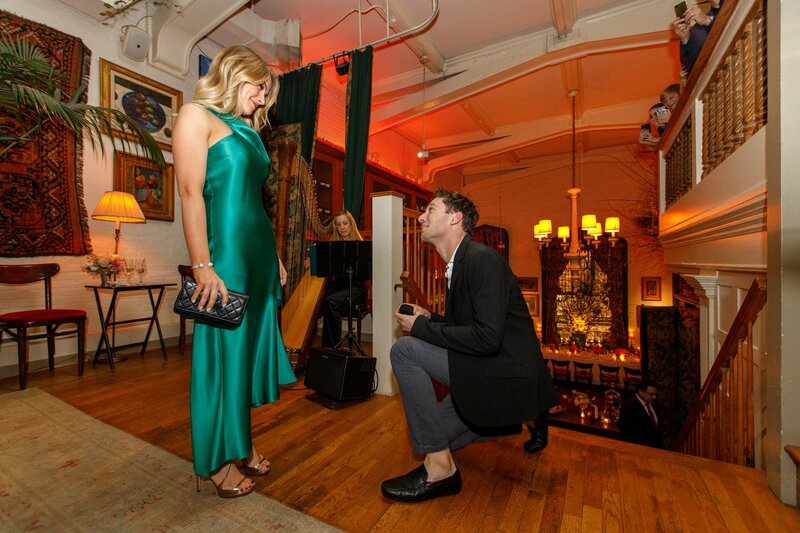 We got this question a lot ” Can you recommend a nice restaurant to go to celebrate after the proposal?”. Of course, we can! 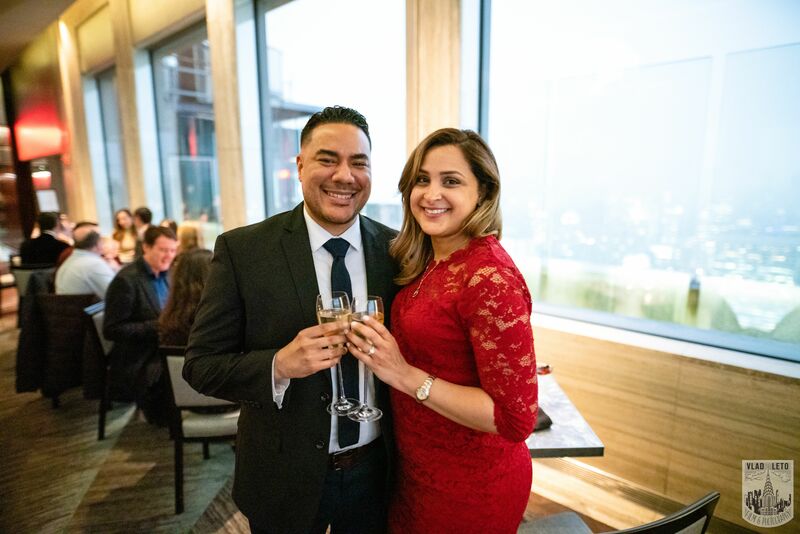 Here is the list of our favorite spots in the city, where we either plan the proposal or our clients had a celebratory meal following the proposal. If you looking for an unforgettable food experience, these restaurants are perfect for the engagement celebration. Cafe Boulud – Daniel Boulud’s cafe is run by chef Aaron Bludorn, serving high-end French fare in a chic setting. Located on 20 E 76th St, New York, NY 10021. Perfect for the brunch and evening celebrations. Jean-Georges – Sophisticated New French eatery boasting floor-to-ceiling windows overlooking Central Park. Located at 1 Central Park West, New York, NY 10023. 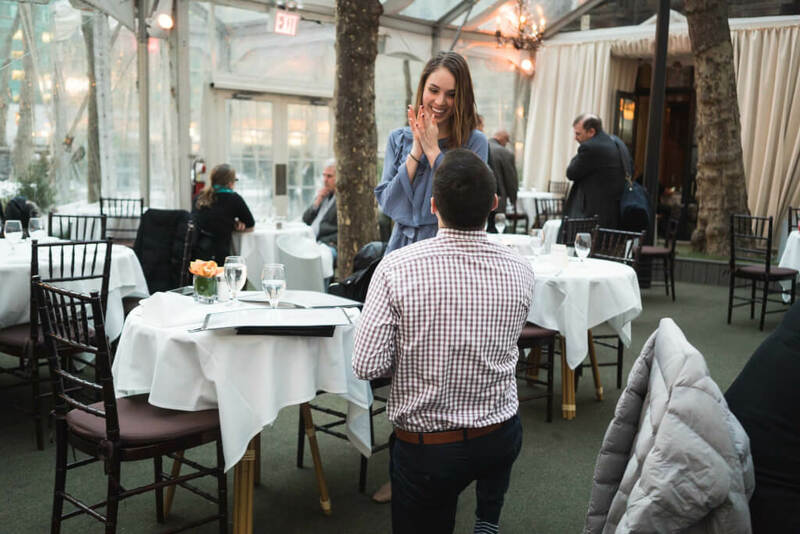 If you proposing in Central Park or Lincoln Center, this restaurant is a perfect choice for the after proposal celebration. Daniel – Daniel Boulud’s elegant French flagship where jackets are required & expense accounts come in handy. Located at 60 E 65th St, New York, NY 10065. Another beautiful spot to go after the Central Park engagement. Eleven Madison Park– Upscale American tasting menus from chef Daniel Humm served in a high-ceilinged art deco space. Located at 11 Madison Ave, New York, NY 10010. If you looking for a private dining experience those place will enhance your engagement and will make the evening unforgettable. Del Posto– Updated Italian classics in palatial surroundings from Joseph & Lidia Bastianich. Located at 85 10th Ave, New York, NY 10011. Ideal place if you proposing at the High Line Park. Mastro’s Steakhouse– The first NYC branch of a high-end mini-chain, serving steaks, seafood & sushi. Located at 1285 6th Ave, New York, NY 10019. 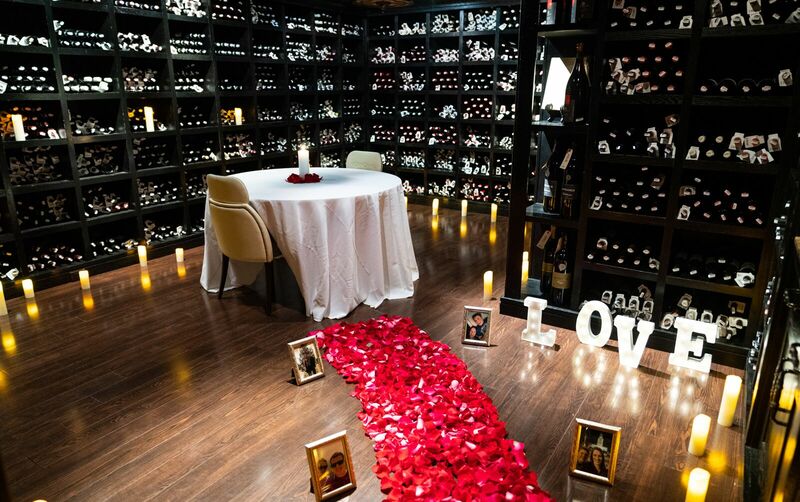 Perfect place to go if you proposing in the Midtown Area. Il Buco– Upscale Mediterranean-Italian plates served in farmhouse quarters with an atmospheric wine cellar. Located at 47 Bond St, New York, NY 10012. Perfect for the friends and family celebration. Bill’s Townhouse– Sophisticated, vintage-style locale with choice American classics, a bar & frequent piano music. Located at 57 E 54th St, New York, NY 10022. Strict dress code and fantastic decor. Freemans– American fare, craft cocktails & Colonial tavern decor draws a hip crowd to this hidden-away spot. Located at Freeman Alley, New York, NY 10002. Perfect for a small group celebration. If you planning to propose during the dinner and looking for a stunning view, those restaurants might be something you were looking for. Gigino at Wagner Park– Waterfront Tuscan restaurant in Wagner Park with Statue of Liberty views from its spacious patio. Located at 20 Battery Pl, New York, NY 10004. Perfect for a romantic sunset proposal by the river. The River Cafe– Landmark eatery, offering a New American menu & stunning views of Manhattan. Located at 1 Water St, Brooklyn, NY 11201. Ideal place for the Brooklyn Bridge Proposal celebration. Rainbow Room– Iconic dining & entertainment venue on the 65th floor of Rockefeller Center with striking decor & views. Located at 30 Rockefeller Plaza, 65th Floor, New York, NY 10112. 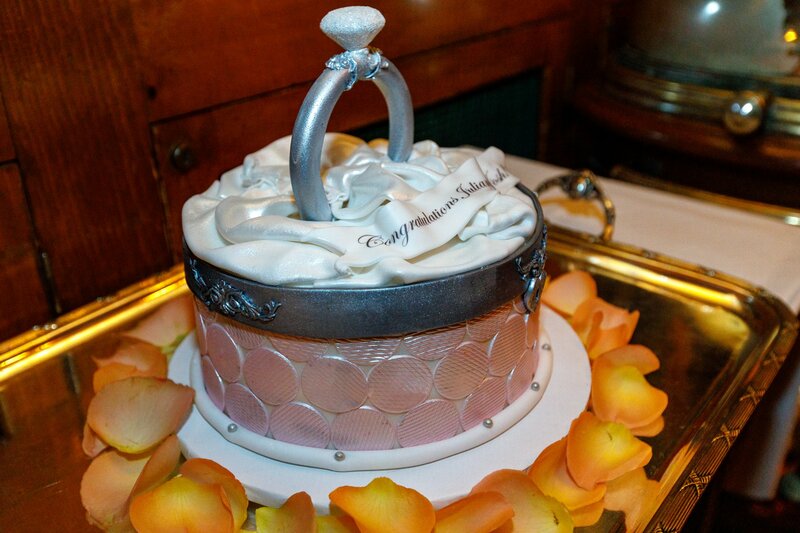 Perfect for the upscale celebration. Robert– New American fare & city views in an arty space on the top floor of the Museum of Arts & Design. Great view to the Columbus Circle and Central Park. Located at 2 Columbus Cir, New York, NY 10019. If you proposing in Central Park, this is a must go place to celebrate after. Manhatta – Manhatta is a new restaurant from Danny Meyer’s Union Square Hospitality Group, combining sky-high views with down-to-earth hospitality. Set on the 60th floor, this ritzy, high-end restaurant features New American cuisine & city views. Located 28 Liberty St 60th floor, New York, NY 10005. Perfect for the FiDi and Tribeca proposals. 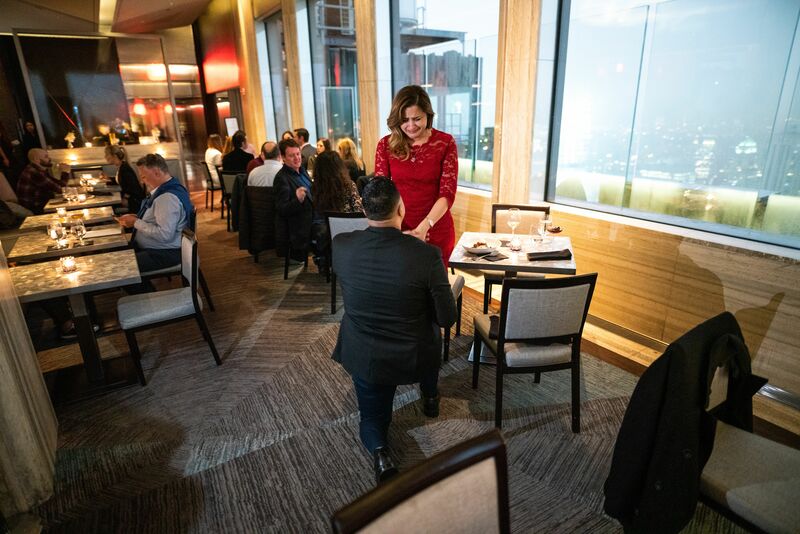 If you proposed after the dinner and not looking for another meal, those interesting bars might be a perfect place to celebrate and tell your partner the whole proposal preparation story. Westlight– Rooftop bar with panoramic skyline views from a terrace & glassed-in lounge plus craft cocktails. Located at 111 N 12th St 22nd Floor, Brooklyn, NY 11249. Perfect summer bar. Serra by Birreria– Scenic rooftop setting for elevated Italian cuisine, house-brewed ales & high-end imported beer. Located at 200 5th Ave, New York, NY 10010. Ideal brunch and early evening place for celebrations. Gallow Green– Open year-round, this roof lounge with a green-garden vibe serves chic cocktails & punch bowls. Beautiful views to the Hudson River, green scenery and Sleep No More theater downstairs. Located 542 W 27th St, New York, NY 10001. 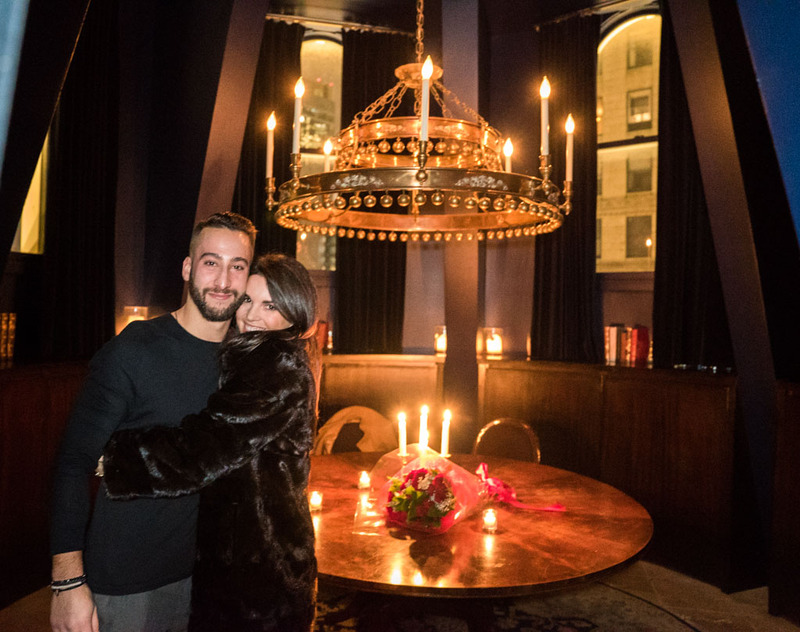 Rose Bar– Exclusive, swanky hotel bar with a fireplace, solid walnut bar & Andy Warhol art on the wall. Located at 2 Lexington Ave, New York, NY 10010. Perfect for the cold days. Known for the jazz nights. 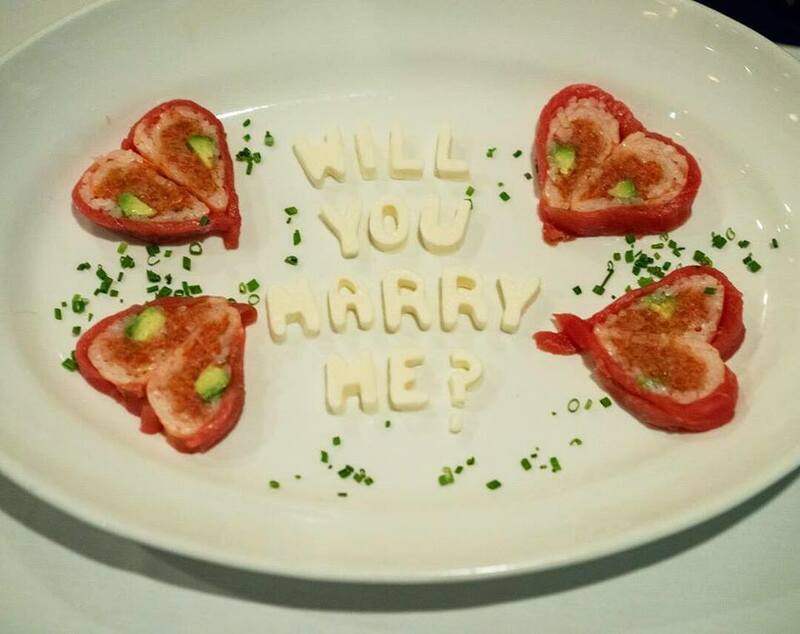 If you planning to propose this season, but don’t know where to start to contact us now head@proposal007.com and our experienced team will help you to plan and execute the unforgettable proposal.